Pat Frantz, one of the early pioneers of the American beadmaking movement, shares her meticulous techniques for working with dichroic glass. From the sublime to the psychedelic, you'll be creating gorgeous beads in no time. 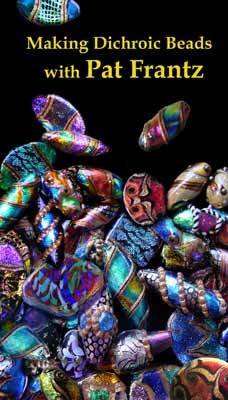 Her helpful hints for protecting the dichroic effects in your beads are essential for success! Discover the best way to treat your dichro, for surface work and encasing. Don't miss it!